This is more of a holiday scone, but I won't blame you if you make them in January! This would be a great way to use up any leftover cranberries lingering in your freezer. The dough comes together easily, with a food processor doing most of the the work. 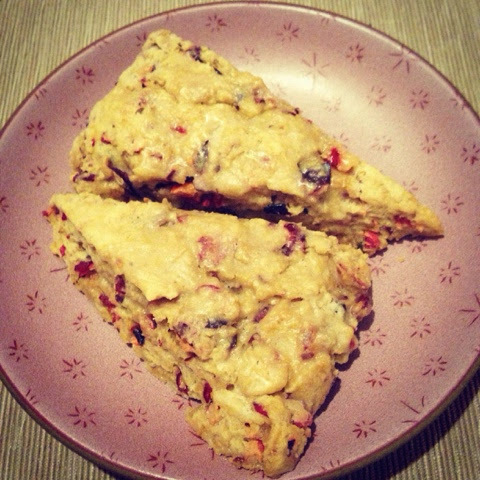 The scones bake up super-moist, and I love the combination of super-tart cranberries with fruity orange zest. However, what really makes these scones sing is the rum glaze. I was worried it would be too intense when I tasted it on its own, as it's very sweet and very boozy. But, once it's drizzled over the scones, the glaze is absolutely perfect! I glazed mine a little too soon, when the scones were still warm, so it melted into them a bit. If you can be patient and wait for the scones to cool, you'll get a slightly prettier result. But either way, these scones are a really delicious way to start your day! They don't keep too well, so I'd plan to eat them within a couple of days. 1. Preheat the oven to 350 degrees and line a baking sheet with parchment or foil. 2. In the bowl of a food processor, pulse the cranberries, brown sugar, and orange zest until lightly chopped. Scrape into a large bowl. 3. In the food processor (no need to rinse), combine the flour, baking powder, and salt. Pulse a few times, and then add the butter. Pulse until the mixture looks like crumbs with a few larger pieces of butter. 4. Add the flour-butter mixture to the cranberries in the large bowl, and mix with a rubber spatula. Add the milk, and stir until the dough just comes together (you may need to use your hands, but be careful not to over-mix the dough). 5. Cover your workspace with a piece of parchment, and dump the dough onto it. Pat into a thick circle, and cut into wedges -- I made 12, but of course you can make your scones larger or smaller. 6. Bake 20-25 minutes, until browned. 7. Make the glaze. Whisk the powdered sugar, rum, and vanilla together until smooth. Let the scones cool slightly, and then drizzle with the glaze. Let sit until the surface of the glaze dries, and then serve.